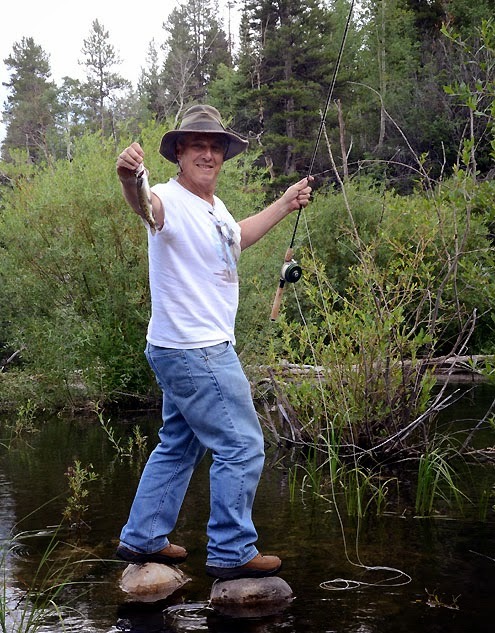 North Texas e-News roving reporter Allen Rich gets ready to release a brook trout that fell for a hopper imitation fly on a small tributary of the South Fork of the Arkansas River. By Allen Rich - Fishermen who prefer smaller streams and want to stay at Monarch Pass west of Salida should contact Gigi Griefenberg, owner of Ski Town Condos. Gigi knows all the best trails in the area and a couple of overlooked streams where brookies are just waiting to volunteer for supper. Enjoy the 7-Night Special for the price of 5 nights at $750 + 6.8% tax! Ski Town Condos offer 2 bedrooms, log beds, full kitchen, washer/dryer, wi-fi, and a hot tub in the gazebo. For reservations call 719-539-7928 or visit www.skitowncondos.com for more details.